It is very clear that the Fed saved big business, but not the consumer real estate market. 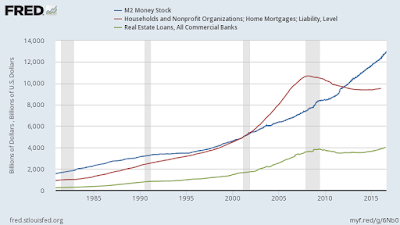 As we can see, the Fed has kept the money stock high, but the red line in the Fred chart below shows that home mortgages have taken a nosedive beginning with the Great Recession and continuing. Certainly the commercial banks lend in real estate, but it has been mostly for big business's benefit. At the end of this article I will show, with the help of Kevin Erdmann, that all of subprime real estate did not deserve to die. But the Fed (a private bank according to the Lewis VS USA court case in 1982), killed it all anyway, and now gives banks welfare checks from the citizens of the United States in the form of interest on reserves (IOR). Prof, I have a question for you. 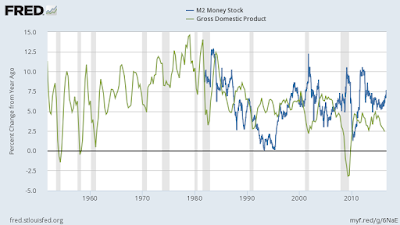 Why did Bernanke save big business but let the RE industry decline and crash in 2008? Was it because the bonds backing RE were inferior to the bonds backing big business? I noticed big business bonds are used as collateral more and more, and I don't know if MBSs are used again as collateral. If that was the case, I am a bit disappointed in the Fed because the Fed adopted the flawed David X Li Copula that led to so many MBSs going bad. I would have thought the Fed had a responsibility to fix that mistake by saving the Commercial Paper market that was the foundation of subprime lending during that time. Federal Reserve Bank of St. Louis, Moody's Seasoned Baa Corporate Bond Yield Relative to Yield on 10-Year Treasury Constant Maturity [BAA10Y], retrieved from FRED, Federal Reserve Bank of St. Louis; https://fred.stlouisfed.org/series/BAA10Y, August 27, 2016. BofA Merrill Lynch, BofA Merrill Lynch US High Yield Option-Adjusted Spread© [BAMLH0A0HYM2], retrieved from FRED, Federal Reserve Bank of St. Louis; https://fred.stlouisfed.org/series/BAMLH0A0HYM2, August 27, 2016. The Fed made no such efforts for the subprime housing market. In fact, since the banks sell their mortgages to Fannie and Freddie, which gives the mortgages a guarantee of government backing, those mortgages are sometimes purchased back by the banks. Like magic, the banks now have guaranteed mortgages. However, Fannie and Freddie will not buy mortgages saddled with high credit risks, even those that are carefully underwritten. Investors, and banks and hedge funds are buying the mortgages that have the government stamp of approval, which means risky mortgages are out. This has forced many on main street to be forced to rent, and to endure massive rent inflation, especially in closed access cities like San Francisco, Los Angeles and Seattle. Closed access cities are those with high paying jobs and little new construction to alleviate demand. It is clear that failed MBSs were not continued as a means of getting money into lenders' hands, but were rather bought up by the Fed, so that going forward, mortgages were only issued to low credit risk people. Securitization died when the Fed took this course of action. Not all securitization was bad but it all died. This course of action also gave Wall Street the opportunity to loan to low credit risk people, who bought, in many cases, hundreds of houses. The Fed also bought up guaranteed MBSs during QE, considering them to be as good as treasuries. This has likely contributed to an unintended consequence of massive rent appreciation. Saving the corporate bonds also became important to the Fed. Killing the subprime lending market and saving big corporations became the goal of the Fed. And sure enough, the corporate bonds are becoming more valuable in the face of shortages of treasury bonds. Rather than buying treasuries for use as collateral, investors can buy corporate bonds, and use them as collateral with a haircut. But they still continue to get a return on those bonds they pledge as collateral. At the end of 2007, the private securitization market collapsed. 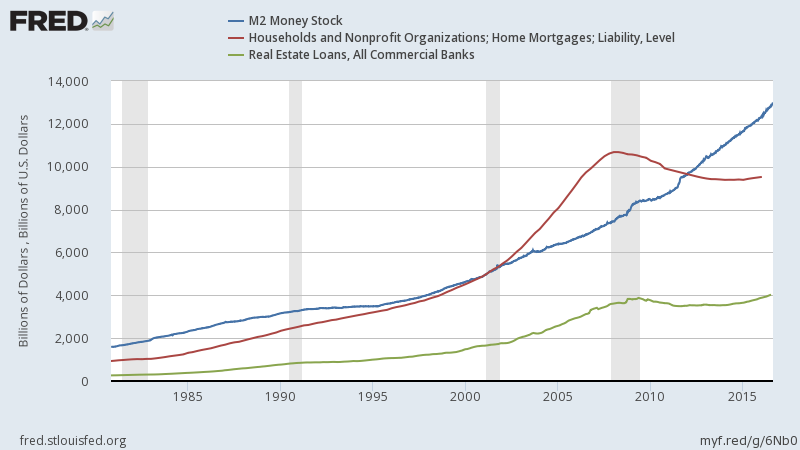 But, at the same time, bank lending and GSE lending also leveled out. As I have pointed out, most of the decline in lower priced homes came well after the mortgage market for those areas was practically shut down. Low priced zip codes in places like Texas and Georgia were losing value in 2009 and after, even though they had never been particularly high, especially considering the low interest rate levels. But, interest rates don't matter much if you can't get past underwriting. Interest rates, and relative costs in general, clearly are not the constraint at the low end of the buyer market, and any analysis that pretends such seems to me like an effort to fit the square peg of past housing constraints into the round hole of the current context. 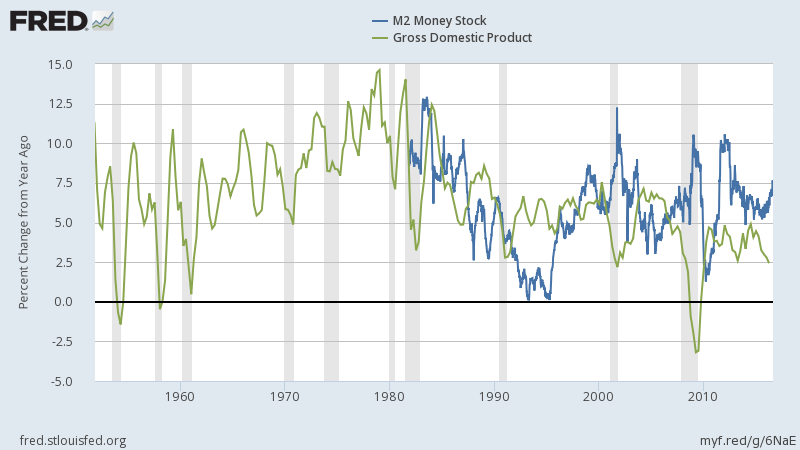 This makes one clearly wonder why the Fed wants to raise rates? While, certainly, no one wants to bump along the zero lower bound, clearly the Fed is willing to lie about the growth in the economy in order to make sure that the banks are not going to go broke like many of them are in Europe under a negative rate regime. Don't be fooled readers, the Fed is not interested in the real economy growing, unless you convince yourselves that raising rates will bring a little inflation. I suppose Neo-Fisherism is possible, but not without at least an attempt to create a small subprime window. The Fed is more interested in banks getting a raise in their welfare checks, the interest on reserves (IOR), that comes with raising rates, than in helping the poor get housing and escape the rent inflation that is clearly an unintended consequence of Fed actions. The Fed killed subprime completely in order to just sterilize stimulus to the banks, and that just seems wrong on every level of human consideration. Sacrificing the poor and lower middle citizenry to sterilize stimulus to banks because you ran out of bonds could be considered diabolical behavior, especially since the Fed and Basel mispriced risk for much of subprime in the first place. The banks are loaded with excess reserves. Now, the banks cannot loan out those reserves, because, as Prof Williamson explained to me, they are assets. But the Fed could loan out against those assets up to 10 to 1. Nobody wants them all loaned out, as that would amount to around 24 trillion dollars. But surely the banks would lend out some against the excess reserves, instead of just collecting welfare checks from the taxpayers. You would think.